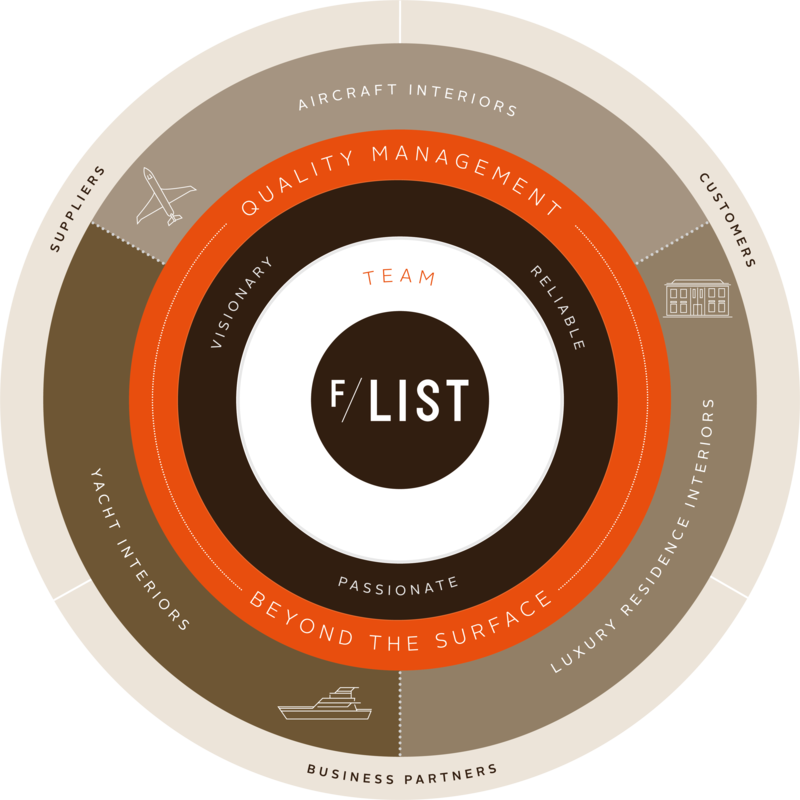 The family company F/LIST pursues a longterm strategy of continuous growth: Financially, through an increase of our equity ratio. Geographically, through an expansion into new markets. Strategically, through the orientation towards the three business areas Aircraft Interiors, Yacht Interiors and Luxury Residence Interiors. What makes F/LIST successful is, ultimately, the entire team and each individual employee. It is they who live by our values – innovative, passionate, reliable – day by day and thus shape the company inwardly as well as outwardly. Without the highly qualified and motivated team it would not be possible to meet the standard of quality we set for ourselves. To make the processes, which are substantial to our high quality standard and thus our success, permanently transparent and verifiable and to guarantee our external partners a consistently high level of quality, we have implemented a quality management system in accordance with EN 9100. This system is subject to permanent revisal of achievement of objectives. First and foremost our quality management system benefits our stakeholders: together with our business partners we aggregate research and development activities to utilize synergies and create the as much added value as possible. For our suppliers we ensure a constant order situation with optimal clarity of requirements.